Attention, Pacers! We are excited to present the 2017-2018 Race Calendar. We know there are many, many amazing races out there—and we encourage you to run the ones you feel super stoked about—but as a club we can only support so many. 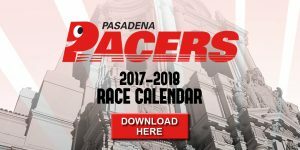 The races on the calendar will have training programs, Pasadena Pacer support onsite, and most likely a fair amount of fellow Pacers in attendance. Some of these races will offer Pacers discounts, others will give us a rebate for every Pacer registered (this helps fund our non-profit, 100% volunteer-run club). More info on specific races can be found on our Facebook page, just look for the events tab. Not running a race on the calendar? That’s totally cool. Hook up with a coach to see which training schedule would be best for you. Also, there’s still a very good chance there will be other Pacers training and running along side you. Safe training and happy racing, Pacers.